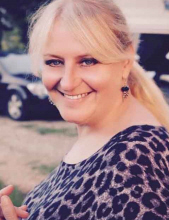 Mrs. Kimberly Kleinhesselink, age 57, of Alton, passed away on Tuesday, April 9, 2019, at the Sanford USD Medical Center in Sioux Falls. There will be a funeral service on Tuesday, April 16, at 10:00am, at the Alton Reformed Church in Alton. Mr. Verlyn Netten will officiate. Interment will follow the service at the St. Mary’s Catholic Cemetery in Alton. Visitation with the family will be on Monday, from 6:00pm to 8:00pm, at the Oolman Funeral Home in Orange City. Kimberly Dawn was born on July 24, 1961, to Earl Joseph and Ruth Edna (Berger) Chaussee, in McCook Lake, South Dakota, where she was raised. She lived in the Sioux City area until 1994, when she moved to Alton. On December 31, 1998, she married Jim Alan Kleinhesselink in Orange City. They made their home in Alton, and she worked at Kraai Furniture in Orange City as an interior decorator for many years. She also attended the Stewart School of Beauty in Sioux Falls. Along with decorating, “Kimber” enjoyed gardening, painting, playing pool, and hosting gatherings and holiday parties for her family and friends. She is survived by her husband of more than twenty years, four children, Brandy Dowson, of Alton; Matthew Dowson, and his wife, Laura, of Canton, South Dakota; Josh Kleinhesselink, and his wife, Anne, of Hawarden; and Jordan Dowson, and his wife, Cheri, of Alton; twelve grandchildren, Jessica Sanchez and Erika Sanchez, both of Mankato, Minnesota; Ava Welle and Breanne Mulder, both from Alton; Hope Dowson, Faith Dowson, and Alan Dowson, all of Sioux City; Alyssa Kleinhesselink, of Alton; Shelby Muse, of Charlotte, North Carolina; Jordan Sansinger, of Sioux Falls; and Kyle Walding and Ryder Dowson, both of Alton; one great-grandson; her three siblings, Sheila, and her husband, Greg Johns; Dana Chaussee; and Patty, and her husband, Steve Beatty; and her best friend, Cheri Harder, of Sioux City. To send flowers or a remembrance gift to the family of Kimberly Kleinhesselink, please visit our Tribute Store. "Email Address" would like to share the life celebration of Kimberly Kleinhesselink. Click on the "link" to go to share a favorite memory or leave a condolence message for the family.